The Champion team from TAR UC comprising Yee Mun Hong (leftmost), Yong Zhen Qiang (second from left) and Khoo Wai Kang (rightmost) together with Ms Tan Wai Beng (second from right), Lecturer of the Department of Information And Communication Technology, Faculty of Computing and Information Technology. 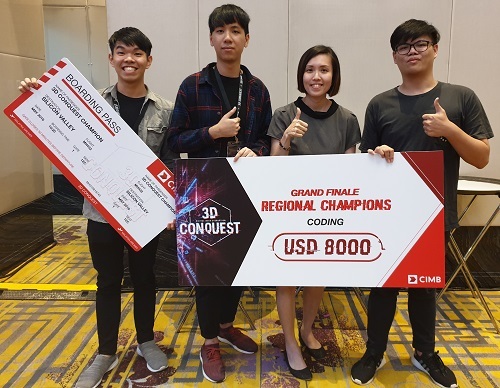 Fresh from conquering the national level of the CIMB 3D Conquest, the seemingly unrivalled TAR UC students namely Khoo Wai Kang, Yong Zhen Qiang and Yee Mun Hong continued their home run at the regional level of the competition by winning the Champion title in the Coding track of the competition. The regional-level competition was held from 16 - 19 January 2019 in Putrajaya and as Champions, they won for themselves total cash prize worth USD8,000, job opportunities with CIMB Digital Teams as well as an educational trip to Silicon Valley in USA. The students were required to develop a payment application that incorporates a digital token for authenticating transactions and for the regional level, the application must be able to function not only on mobile devices but on laptop or desktop browsers as well. The students used the authentication method they developed during the national level of the competition called TapPy, which is a rhythmic authentication method. Instead of using passwords, users need to tap a rhythm familiar to them to perform transactions. In addition, instead of a 6-digit code required to complete the transaction, TapPy uses pictures for verification purpose. “The judges liked our solution as it is simple, not cluttered and straight to the point. In a nutshell, the system is very user-friendly. On top of this, I believe our ability to confidently answer the many questions posed by the judges on our solution was a huge advantage that contributed to our win,” Mun Hong shared. Mun Hong and Zhen Qiang are pursuing their Bachelor of Computer Science (Hons) in Software Engineering whereas Wai Kang is studying the Bachelor of Information Technology (Hons) in Software Systems Development in TAR UC. “The regional level was much more challenging as we had to ensure that the solution we proposed would work smoothly on mobile devices and laptop or desktop browsers. We definitely felt the pressure of lack of time because there were many levels of development such as server side set up, front-end as well as back-end programming which required us to have the right knowledge and information to perform them. 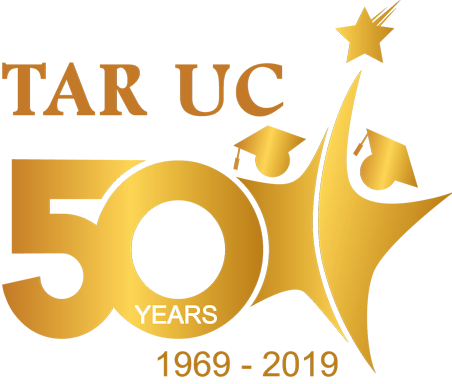 It was at this point we discovered that the subjects we have learnt in our degree programmes came in very handy as we were only given the task on the competition day which resulted in us not being able to do prior preparations for the competition,” Mun Hong shared. The regional level of the competition attracted 33 teams from other countries such as Singapore, Thailand, Indonesia and Vietnam.